Have fun in this one-time class for adults & children (ages 5 & up) and families interested in experimenting with clay for the first time. Two sessions to choose from this winter. Have fun in this one-time class for adults, children (five years old and up) and families interested in experimenting with clay for the first time. 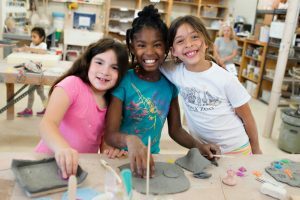 Plan a great afternoon with friends, family, or just for you while exploring your inner artist in this fun and messy introduction to clay! Professional ceramic artists guide themed weekly hand building projects. Projects take between 1.5 – 2 hours. Want to keep your masterpiece? Projects will be glazed and fired and available for pick up in 2 – 3 weeks. This class includes materials and firing. Children under 12 must attend with a guardian enrolled in the class.